Are you aware of the startling statistic: At least 75% of the American public is chronically dehydrated. And did you know that mild dehydration often poses as hunger pangs? That's a fact! Healthy hydration is necessary! Are your employees "feeding" their thirst with food? 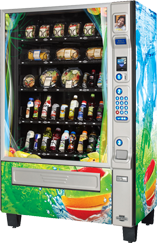 At Champion Vending we offer an array of healthy beverages, customized to meet your needs. Our healthy beverages selections include a variety of diet sodas, water (flavored included), Sweet Leaf Tea™, sports drinks, juices, and more. So when you need a cold, refreshing beverage, enjoy one of our low-calorie, low-sugar options. Refreshed is the way you'll feel while staying away from high calorie, less healthy alternatives. Call today (800) 558-5450 for a no-cost, no-obligation assessment and quote and start offering tasty, satisfying, healthier alternatives tomorrow!